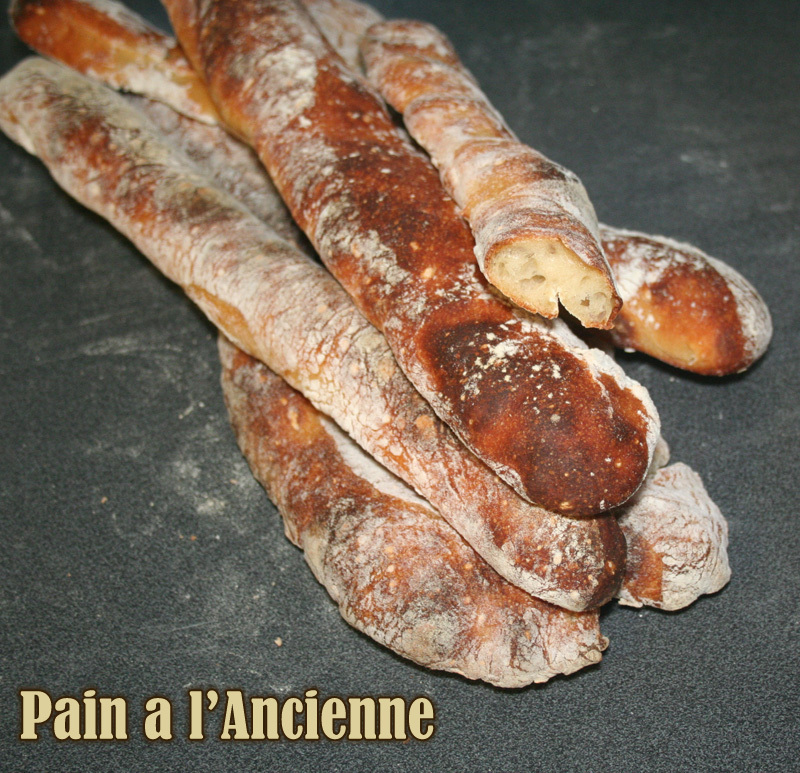 Pain a l'Ancienne - Tiny Baguettes or Giant Grissini? Pain a l’Ancienne or Giant Grissini? This one was not so good. So I won’t spend a lot of time on the details. Suffice it to say there were enough problems with the finished product and the process that it’s not a type of bread I’d be open to revisiting any tine soon. 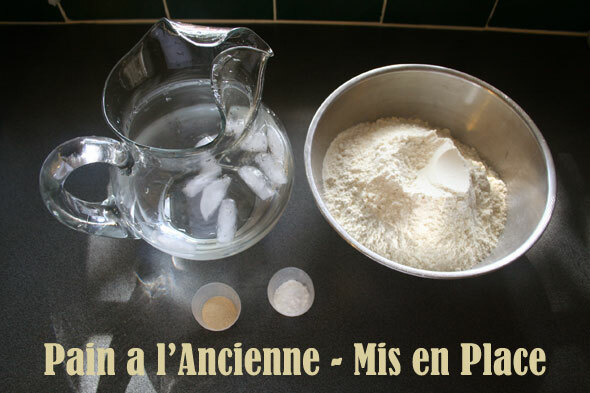 Ice water, flour, salt and yeast. Can’t get much simpler than that. Mixing the above ingredients, we’re told it will be a soft dough, but I wasn’t expecting THIS soft a dough. 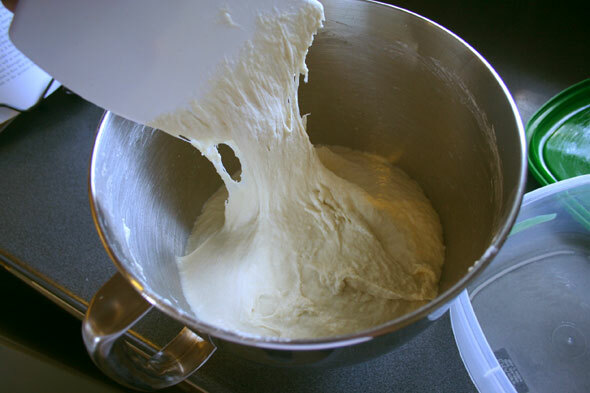 The dough at the mixing stage looked fine, for wet dough. 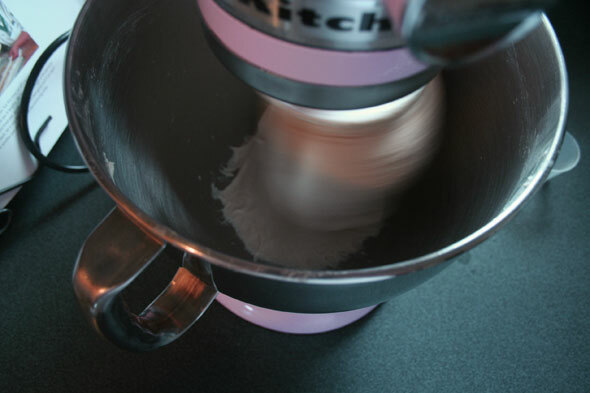 It still cleared the sides and stuck to the bottom while it was being kneaded in the mixer. 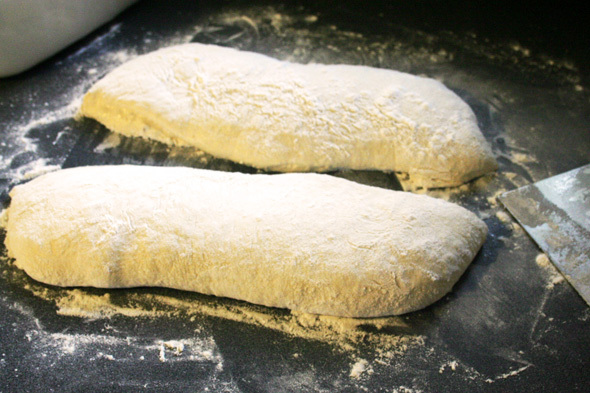 When the kneading was done, however, it seemed live very droopy dough. But again, we’re told to expect it to be a soft dough, somewhat like Ciabatta dough. OK, so we’ll go with this. 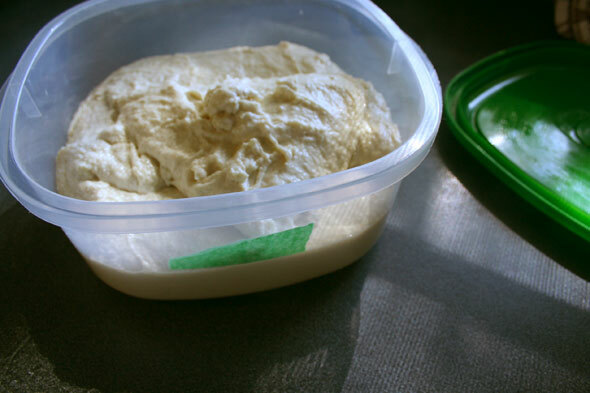 The dough is poured (yes, decidedly “poured”) into the greased bowl and placed in the fridge to retard overnight. 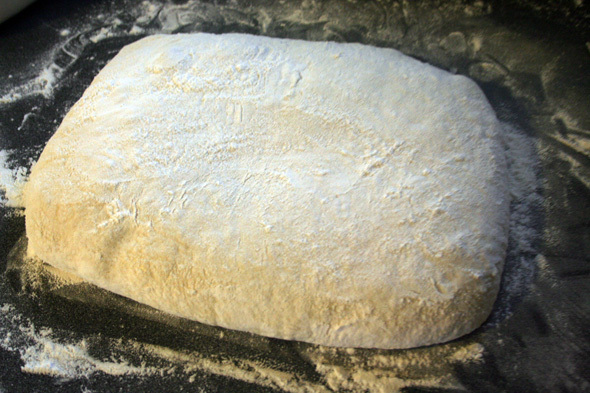 The dough glob is then sort of coerced into a shape about 8″ X 6″ then split into two sections lengthwise. Not all of the next few steps are pictured because it was enough of a battle to handle these very stretchy dough worms. I took one of the two halves and split that further along the length into three long chunks. It was like trying to corral soppy jell-o. I transferred the very well floured ropes of dough to a rimless and floured cookie sheet and then slipped these off the cookie sheet onto the pre-heated baking stones at 500º. Add steam, spritz the inside three times every 30 seconds then bake for about 10 minutes until browned and 205º inside. Of course, in the transfer process, a tiny bit of the wet dough stuck to the cookie tray and caused all manners of problems since the dough was so soft and stretchy. So two of these small and thin loaves ended up on the stone in pretty twisted shape, after a fair bit of cursing and while the oven door stays open letting out a fair amount of heat. Good thing the oven stone’s in there to hold on to a fair bit of heat. So while the first three loaves cook, I decide for this second half to not handle these next loaves so poorly and instead place them into their own baking tray and they’ll go into the oven as such, tray right onto the baking stone. 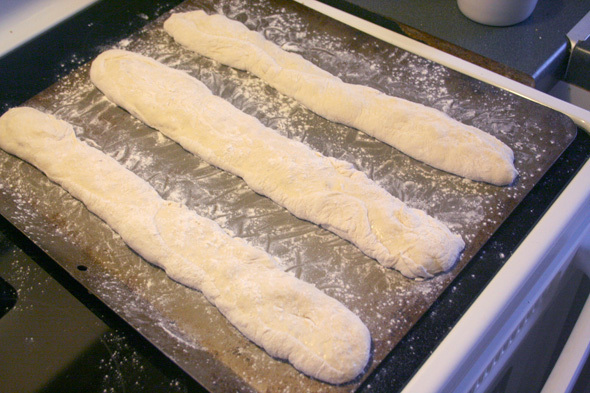 Although it is hard to tell in the above photo OR in Reinhart’s The Bread Baker’s Apprentice photo – there are no real reference points in their photo to judge scale – these came out to be very small baguettes or, more accurately, large grissini. The cut loaf in the above pic is about 1.5″ across. The crust was very tough as was the crumb, in spite of having achieved a decidedly holey texture. The loaves could easily just be a “dinner roll” worth of bread. I think the best we’ll be able to do is slice them very thing and crisp them up to make little bread crackers. The actual flavour was not bad, but the fact you had to build up your jaw muscles in order to chew these just doesn’t make it worthwhile. So on a five-loaf scale, this one’s a 1.5 and goes into the “Won’t do that again” pile. Maybe I’d make an effort if there weren’t many better brads we’ve made, but alas there are. This one stands out as a fair bit of work for not very useful results. The Italian Bread still beats the pants off this and most other breads so far. Next up: Pain de Campagne. Both you and Mags have posted disparaging remarks about this bread. 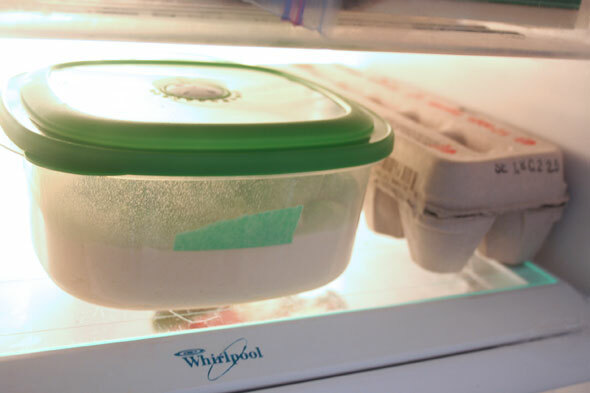 I have my dough in the refrigerator and am not really looking forward to wrestling with worms that don’t end up worth the effort. Italian Bread remains one of my favorites. Thanks for writing it up anyway. Don’t forget that there’s been a few people rave about it too, so the reviews are mixed. If nearly everyone was saying “ho hum” or “bah”, then maybe it would be a questionable move. My experience may not be the same as yours. Give it a good ol’ college try and see how it turns out. Who knows, maybe there was too high an atmospheric pressure in my area that caused it to not work out (just fer example) but yours will be great. Won’t know until you give it a shot. Besides, even though it’s iffy for me, it’s still getting eaten up. Sliced thin and baked to crispy, it makes OK crackers, like slightly tough melba toast. It still holds stuff (cheese, salsa) ok. I wonder why the crust and crumb came out tough. I’m one of those who raved about it and can’t get enough of this bread. The loaves I made were light and airy with a crispy crust. My family loved the flavor, ate them all up so I baked another batch the next day. Haven’t had a chance to write them up but we are home from a crazy day, enjoying a loaf with wine and cheese. They taste great. The worms were difficult to work with but I’d make them again. It is fascinating to see how the breads work for everyone. While I don’t wish ill results on anyone making this bread, I’ll admit it’s reassuring to know that I’m not the only one who struggled greatly with this recipe. Good try Paul! Crazy! This is my all-time favorite recipe from the book. I have made this bread perhaps a dozen times and it has never failed to please. Maybe you needed a bit more flour or less water, I have never poured this dough, even though it has an incredibly high hydration. I haven’t made these for a while, (well I made pizza with the recipe a few months ago) and the dough is tricky, but at the same time easy in a way. I think for this bread in particular using parchment paper makes it a bit easier. The flavor of these when I’ve made them has been amazing though! They do get kind of tough and chewy after a day or two, but they were always fine the first day for me. You gotta give them another try! Or at least make pizza with the dough, just be prepared for really thin crust. I just baked these today, and I felt the same way about wrestling with the wet dough! I do, however, love the flavor and the chewy crust, but mine didn’t even develop large holes. Interesting that my dough looked almost exactly the same as yours in the KA and in the pour to the counter . . . I am determined to try again. I am within one hour of “wrestling” with my dough….. I read all the reviews, and I am a little worried…. 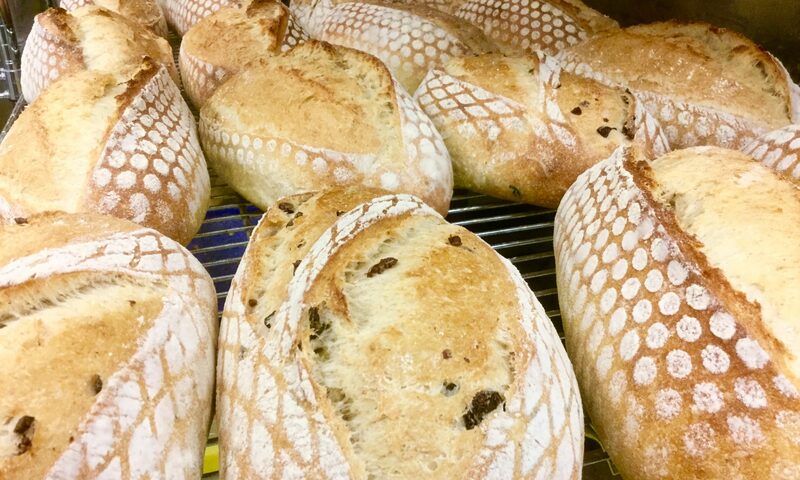 I think your breads look wonderfully rustic! I’m sorry you didn’t like this bread. I made this yesterday and LOVED it! I thought the chewy texture was fantastic. I do agree that they were kind of skinny, sort of like oversized grissini. I wonder what would happen if we divided the dough into 3 instead of 6? I may just try that. I can’t agree w you more w all the troubles you came across. I hv been thru’ it. But I found it extremely convenient to do pizza crust by using this method. I did it many times, and it turned out perfect, both appearance and taste. See my blog (weblink attached ~ pizza page). 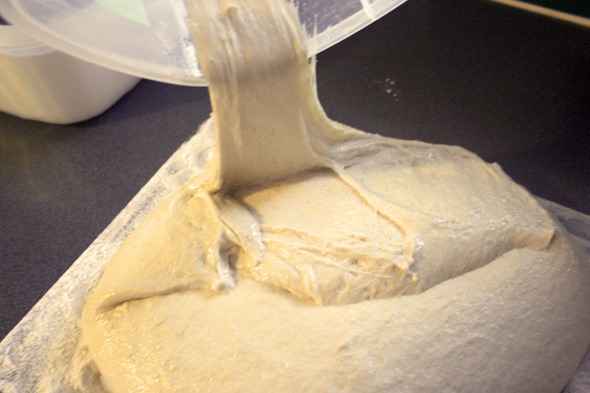 This way of preparing dough needs no kneading at all. 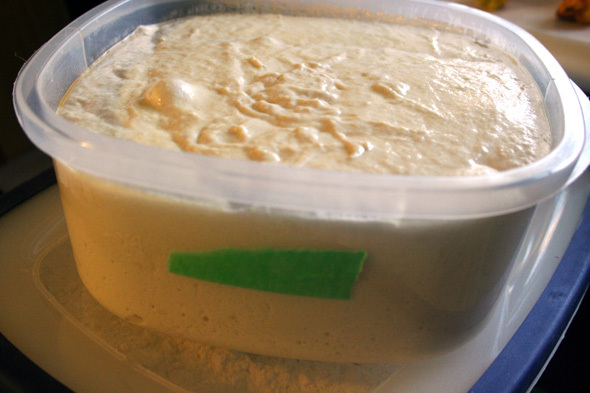 Dough is extremely soft after being stored in the fridge overnite, and when returned to room temperature. I simply dust flour (adequate but not too much) over it to avoid its stickiness, and stretch it lightly to a thin crust. Taste is perfect ! I have made this and must disagree a bit, I made the dough a bit less wet, the result was very very good, huge holes in the dough, thin crispy crust, let the bread bake a bit less than suggested to a more golden crust instead of darkbrown, came out very nice and was gone in a day, friends loved it as did I, definitly will do it again. This is one of my favorite recipes in the book, however I got mine from ABED instead of BBA. Mine had a very thin crispy crust and a moist chewy interior.